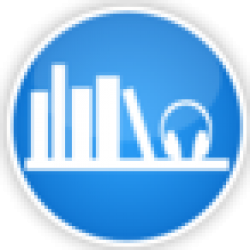 ABR's full The Acolytes of Crane audiobook review and many others can be found at Audiobook Reviewer. How do you scratch your head on paper? If you put this book in the Young Adult Science Fiction category it has a chance of working for its audience (13-17 year olds). Others, not so much. 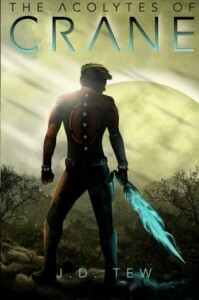 The protagonist, 15 year old Theodore Crane, gets chosen by an alien demigod to save the world. He has to get four friends to join him by the end of the month or something bad will happen. This rambling messy story is told by the slightly older Theodore who is being held and tortured in some unknown multi-universe prison telling his story to an iPad-like device that keeps running out of power. The story goes into great detail about the trees he climbs, but never why he’s in prison or how he got there. Tew has a great imagination, and has presented some interesting characters, but the writing is a mess. At first, the strange choice of words is kind of endearing, like he is experimenting with the language in a new way. But eventually, it becomes clear, the writer is simply using words he is not sure the meaning of. This is too bad, because this could be a good book for teenagers. There is a lot of well described teenage angst and awkwardness. Unfortunately, it needs some serious editing. The narration is by Tom Pile. He seems to do a reasonably good job, it is just too hard to tell as the writing is so awkward and the dialogue so stilted. The best voice effects are the demigods and robots, nice and deep. Some good sound effects too.